This week I am reviewing Spoofee.com. 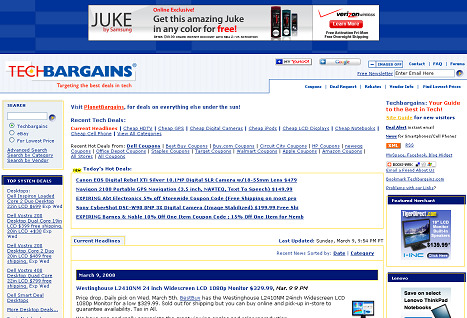 This site is at the 16th position in Yan’s latest revision of popular deal sites. 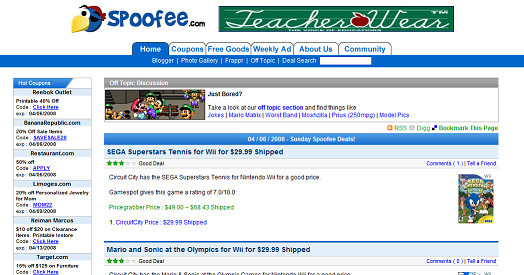 Spoofee.com features a mix of deal sites typical features such as deals, coupons and forums. On the first look, Spoofee.com has a clean and uncluttered look and feel. This site uses variations of blue and white, which is now used in several popular sites. The top menu contains links to the coupons section of the website, freebies section of the forums, a page listing links to weekly ads from various stores, a link to the forum index (termed as community) and an about us link. iv. Detailed instruction on how to get the deal, sometimes the deals instruction is as detailed as buying a coupon code from Ebay. As you can see, this information is really comprehensive. A quick check showed that most of the deal details are accurate. On the coupons section, there are about 300-350 active coupons. The forum section has a variety of topics as in other sites, with topics for Deals (which also includes comments for the items posted on the home page), Freebies and Giveaways, Coupons , Off Topics etc. The Coupons section of the forum has about 3-4 coupons posted per day. The Freebies section is really active and has a about 10 new posts per day. Given that the deals posted on the home page are so informative, one might wonder why Spoofee.com is not as popular as leading deal sites. In my view, the answer to this is the very small number of deals posted per day. Additionally, the number of coupons is also less (300-350 active coupons) for the given wide range of stores. Thus though very strong on the quality of the deals posted, the quantity doesn’t help make Spoofee strong as neither a deal site nor a coupon site. Wanting to pick a site to review, I referred to the latest revision of Yan’s Popular Price Comparison Sites series and found that ugenie.com went up in traffic by 59%. But on going to the website, I could not find anything about price comparison, but about IRead (totally not about shopping), their Facebook application. Googling found this link, which talks about a lawsuit and other issues. Summarizing quickly, UGenie (allegedly) happily ripped (scrapped) off another website gig’s of data to build a course textbook search engine. Though scrapping is done very often, Ugenie has scrapped from a single source very valuable data worth a lot of human hours (details about courses and their linked textbooks). And now UGenie is gone. However inner links like this are working. Now again wanting to pick a site to review, I picked the youngest baby among the latest revision of Yan’s Popular Price Comparison Sites series, thefind.com. thefind.com is actually the second youngest in the list (next to ugenie, which should no more be in the list) and the second best performer last month (30%, again next to ugenie.com’s 59%). First look at the home page (this is the first time I have ever been to the site): looks different compared to most popular price comparison sites. A quick read on the home page suggests that “search” is their strength. 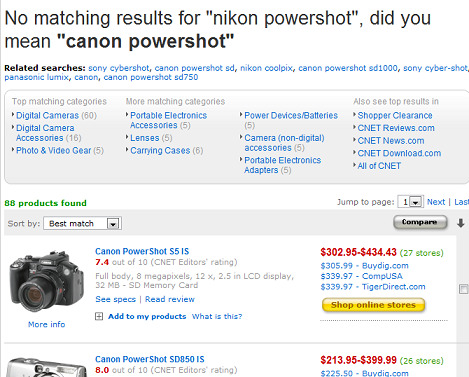 So, I am going to try the same set of searches I tried on PriceGrabber and Cnet Shopper. Last week Yan had written about RetailMeNot’s launch of a shopping community quoting from this TechCrunch story. After reading those stories and various comments at TechCrunch, I wanted to review RetailMeNot (RMN). RMN is the first coupon site I am reviewing. RMN certainly does not have a typical coupon website look (cluttered design) but a rather interesting look, though a bit girlish in my books ;). Users rating coupons by indicating if the coupon worked is a brilliant idea. Even though the idea carries a very small execution, the effect of the voting can be seen in Yan’s monthly coupon site ratings, with RetailMeNot at the 2nd position. Also, user’s have the option to submit coupons. The TechCrunch article notes that RMN features about 71,000 coupons from 13,000 merchants, which sounds very impressive. The success at RMN should also be attributed for not being behind in technology. The Firefox Extension, IGoogle Gadget, Bookmarklet and Mac Widget are some good examples. RMN also uses some of the buzz features popular with websites, such as Tag Cloud, related tags etc. Being a user driven coupon site, the quality of coupons cannot really be attributed to RMN (good or bad) but should be attributed to its users. I have used their coupons in the past and the coupon ratings there generally seem to be good (meaning, if there is a 60% or more rating, there is a bigger chance of working for you). This week I am reviewing shopper.cnet.com and is the second price comparison site being reviewed by me. This review will be similar to the review of Pricegrabber.com to make it fair. The homepage is clean with nice categorized menu options. Major part of the top of the main page content is for popular products, which lists three products in each of the popular product categories. Biggest strength for Shopper.cnet.com is the editorial product reviews by its staff and these reviews also help in deciding the popular products. This week’s review is about TechBargains.com, which is one of the top ten deal websites in Yan’s popular website series. I should here note that, except for AnandTech which is a not really a dedicated deal website, every other website above TechBargains.com has been reviewed in the past. Here is my first impression on visiting the home page, lots and lots of information in a single page. But there is a limit to it and this is too lot, to call it overloaded/cluttered. Doing a print preview (A4) on Firefox shows that there are 20 pages of content, which is about 11,500 words! Wow, that is just too much for any homepage. Added to this are the advertisements (banners, block of Google text ads) etc. The homepage has a 3 column layout with the left side listing pretty much all the popular items in most categories while the right side is a listing of coupons for most of the websites they deal with. The center column lists deals for the past 2 days (no pagination) followed by two blocks titled “More News” and “Non-tech News” and which are nothing but again deals. A quick reading of the FAQ shows that they refer the deals as bargain news. On continuing to read the FAQ, it shows that this website aspired to be a website like AnandTech (guide people on making decisions on tech products and additionally help in buying them) but then a visit to Product Reviews section of the forum shows that, this aspect of the website just does not make any appeal.